I, really don't understand why this dentist and oral surgeon would commit such a grossly negligent act. Police in Colorado say a dentist reused syringes and needles potentially exposing thousands of patients to HIV and hepatitis infections. Over the weekend, the Colorado Department of Public Health and Environment sent letters to 8,000 patients of dentist Stephen Stein, urging them to seek tests for the diseases after learning of "unsafe injection practices" at two Denver-area clinics he owned between September 1999 and June 2011. Investigators found that Stein reused needles and syringes in patients' intravenous lines at both of his clinics. Stein's lawyer says he "is cooperating with the state's investigation." 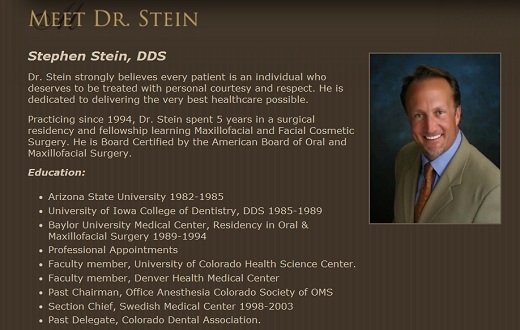 Stein's license to practice dentistry in Colorado has been suspended. A spokeswoman for the U.S. Attorney's Office in Denver, said Stein was already the target of a criminal probe for possible prescription fraud. I guess we will learn more during the investigation. Here is more on the story which has been kept under wraps for some time. The state's department of public health spokeswoman Jan Stapleman said the investigation into Dr. Stein's practice began in April but have told 9News that it took time to investigate the case thoroughly. Dr. Stein was suspended by the Colorado Board of Dental Examiners with an agreement to stop practicing in June 2011, but the department has been unable to locate him. According to the Denver Post, the board declined to say why they voted to suspend Dr. Stein but that it was for reasons before the infection risk. Here is a video report and the whereabouts of the dentist is unknown.